The following steps are provided to help get you started projecting PowerPoint presentations with your ShowMate. For complete instructions on how to use your ShowMate, please refer to the ShowMate User's Manual. You may also download a PDF version of these Getting Started instructions for future reference. Receive your registration information via e-mail. When prompted, enter the registration information e-mailed to you in step 1. Practice Presentation for Smartphones (ZIP file, 610KB). Once the presentation has finished transferring to the ShowMate, use the presentation menu or shortcut keys to control the presentation. Windows Mobile handheld® handheld with Windows Mobile handheld software 4.2.2 or higher is supported in a beta build of the software. 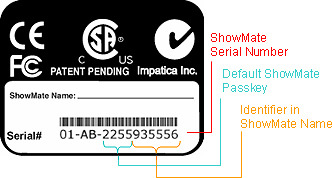 To receive this version, please contact Impatica Customer Support.